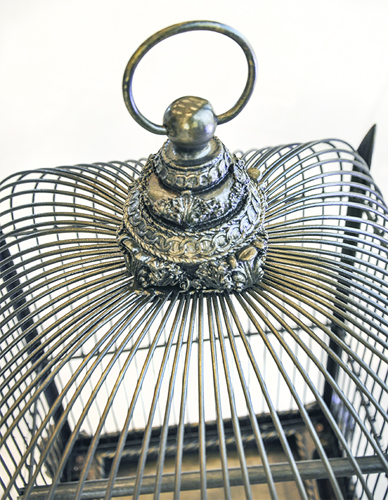 Decorative Bird Cage Conservatory Bronze. 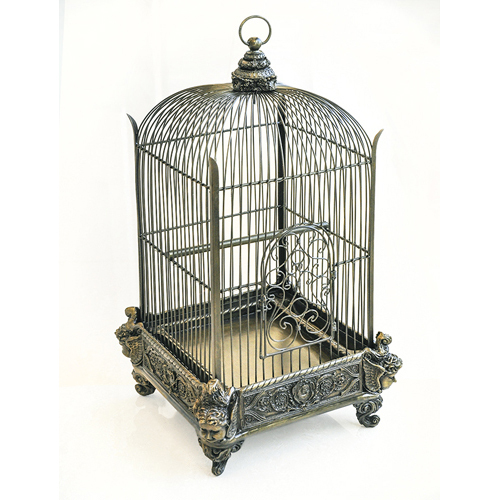 A gorgeous four post gold finish conservatory bird cage. Antique style with fancy top and cherub heads adorning each of the four corners around the footed base. Its resin base adds durability and structure and provides for easy cleaning. It has metal wire bars adding shine and luster. It has a ring on the top for easy hanging. This bird cage can be used for live birds. Although the base is not removable, it has two separate built-in grooves on the left and right sides of the cage for food and water. 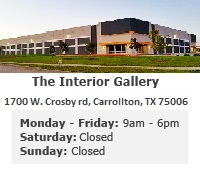 The average spacing between the weathered style metal bars is - 5/8 in.